New analysis published in The Lancet Planetary Health, May 2018, shows that meeting the UK’s Climate Change Act commitments could cut nitrogen dioxide (NO2) air pollution by 50-60%, contributing to improved public health and longer life expectancy. The Act requires the UK to reduce greenhouse gas emissions by at least 80% on 1990 levels by 2050. In this modelling study, we combined a detailed techno-economic energy systems model (UK TIMES), air pollutant emission inventories, a sophisticated air pollution model (Community Multi-scale Air Quality), and previously published associations between concentrations and health outcomes. We used four scenarios and focused on the air pollution implications from fine particulate matter (PM2·5), nitrogen dioxide (NO2) and ozone. The four scenarios were baseline, which assumed no further climate actions beyond those already achieved and did not meet the UK’s Climate Change Act (at least an 80% reduction in carbon dioxide equivalent emissions by 2050 compared with 1990) target; nuclear power, which met the Climate Change Act target with a limited increase in nuclear power; low-greenhouse gas, which met the Climate Change Act target without any policy constraint on nuclear build; and a constant scenario that held 2011 air pollutant concentrations constant until 2050. We predicted the health and economic impacts from air pollution for the scenarios until 2050, and the inequalities in exposure across different socioeconomic groups. NO2 concentrations declined leading to 4 892 000 life-years saved for the nuclear power scenario and 7 178 000 life-years saved for the low-greenhouse gas scenario from 2011 to 2154. However, the associations that we used might overestimate the effects of NO2 itself. 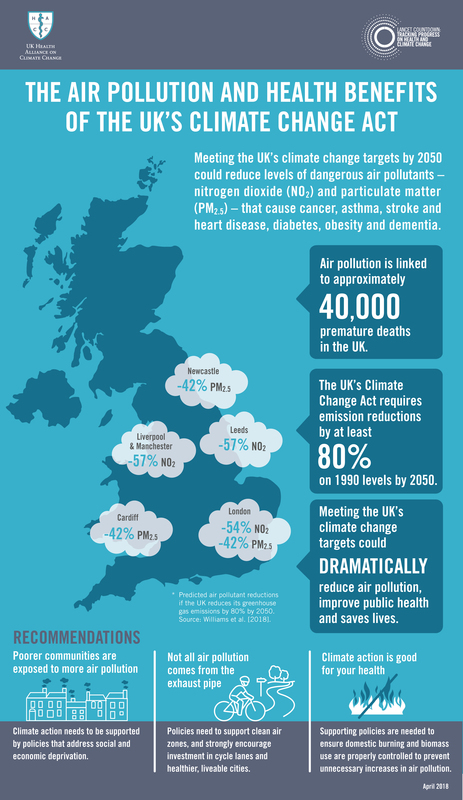 PM2·5 concentrations in Great Britain are predicted to decrease between 42% and 44% by 2050 compared with 2011 in the scenarios that met the Climate Change Act targets, especially those from road traffic and off-road machinery. These reductions in PM2·5 are tempered by a 2035 peak (and subsequent decline) in biomass (wood burning), and by a large, projected increase in future demand for transport leading to potential increases in non-exhaust particulate matter emissions. The potential use of biomass in poorly controlled technologies to meet the Climate Change Act commitments would represent an important missed opportunity (resulting in 472 000 more life-years lost from PM2·5 in the low-greenhouse gas scenario and 1 122 000 more life-years lost in the nuclear power scenario from PM2·5 than the baseline scenario). Although substantial overall improvements in absolute amounts of exposure are seen compared with 2011, these outcomes mask the fact that health inequalities seen (in which socioeconomically disadvantaged populations are among the most exposed) are projected to be maintained up to 2050. The modelling infrastructure created will help future researchers explore a wider range of climate policy scenarios, including local, European, and global scenarios. The need to strengthen the links between climate change policy objectives and public health imperatives, and the benefits to societal wellbeing that might result is urgent. Reference. Briefing for Policymakers. Infographic. Next Next post: L’eau de mer, future solution alternative aux pesticides ?